The traffic on East 4th Street is getting increasingly dangerous with the large snow piles. With the safety of our students in mind I would like to modify our morning drop off. 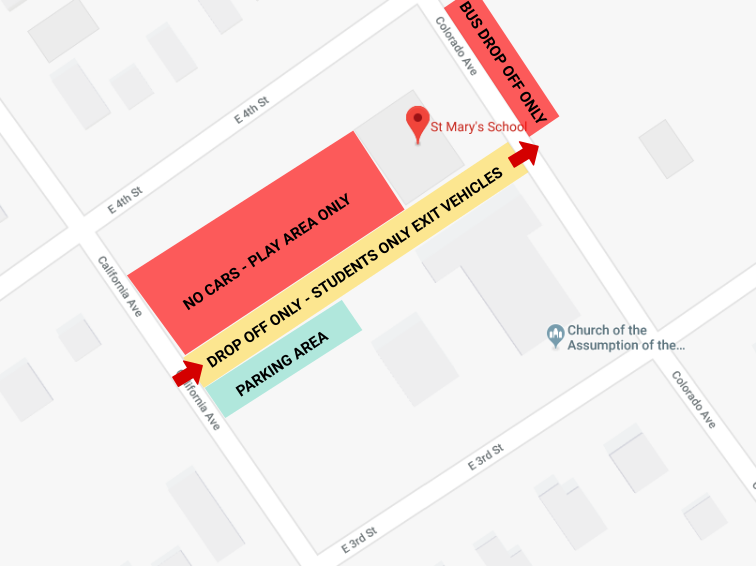 Families can drop off students in our playground area in the morning by entering on California Ave, letting students out of the vehicle and exiting on Colorado Ave. ONLY STUDENTS SHOULD EXIT VEHICLES. If you or someone else needs to exit a vehicle please park. If you intend on parking we ask you to do that on the street to allow us to keep a constant flow through the drop off area. Please see the image below for a reference. Please only drop off in the yellow area – entering on California and exiting on Colorado. DO NOT ENTER ON COLORADO AVE. I hope that this will make morning drop off easier and, more importantly, safer for our kids. Please let me know if you have any concerns.